Trace antennas are the way to go. Once you have a good design it will be reproducible and stable. Cellphones have the phone, wifi and bluetooth antennas printed as traces. The biggest issue is get it to match 50 ohms at the desired frequency. I use pcb material for my half wave dipoles. It's low cost and mechanically stable. BTW. The thinner an antenna is, the narrower the freq range it will operate over, compared with a fatter antenna. John, several people are asking me for trace antenna. While the wire is currently the recommended cheapest and most flexible option, do you have any tweaked working trace antenna designs for 433/915mhz, anything you could share? I imagine this means the antennas will take another half a Moteino, but still would be great to know what the alternatives to the wire are. UPDATE: there are now Moteinos with Trace antennas available in the shop. Are what I have used as my primers on Helical antenna, I suspect most people are after a "Normal Mode" Helix, so the diameter and length of the helix should be smaller than the wavelength. 692.36mm is 433MHz wavelenght, so as you can imagine, most coils will be normal mode. Most pre-made helicals I have found use a 6mm diameter and equal spacing. This technique has worked for me (if I find the website, I will post it too) Take a 1/4 wave lenth of wire and a something like a pencil and wrap it tight, then to get an even spacing just pull it apart slightly from each end. You can use this "springyness" to tune a helical to a degree to get the best out of them, but they will be about half the gain or less than if it were just a straight whip. I'm no expert either, but I sat next to one at a previous job :-). You may find that putting your antenna on the same PCB as your CPU can cause some noise issues which reduces the effective receive sensitivity, unless you are very clever with the routing. I am still amazed by how cellphones manage to integrate all the antennas that they do (3G, wifi, bluetooth, GPS etc) but of course it becomes easier at GHz frequencies. The 315 MHz wireless home security sensors I've seen use a U-shaped wire loop that comes out perpendicular to the PCB. I have previously made a trace antenna for 915MHz RFM12B modules using the Texas Instruments reference design for a meandering monopole antenna. I didn't have any method for matching the impedance so I just hooked it directly to the module. The performance was noticeably lower than just a piece of wire and much more directional (laying the board down so the antenna radiated up/down caused dropouts). I also know nothing about antenna design other than the basics of how antennas in general work, so there might also be something massively wrong with the design. I've attached the EAGLE brd/sch if anyone wants to play with it. ANNNNNnnnnnd THAT is why I'm not an RF engineer. Just looking at and attempting to read the app note makes my head hurt. I wonder if one uses a monopole or a dipole that is not a half the wavelength but a multiple, like 2..4 times the 1/4 of the wavelength for a monopole or 2..4 times the 1/2 of the wavelength for a dipole, would it increase the antenna gain? How about the impedance? I've read a lot about dipoles and monopoles with a ground plane but it's always just shortly mentioned that an antenna should be N times the half wavelength and such but they never write about possible benefits, drawbacks, gain etc. For example, would a full wavelength dipole have 2 times the gain of a half-wave one? This way it would be very easy to increase gain (at the expense of longer, more inconvenient whips). You are thinking correctly. The dipole antenna needs to be an odd number of half wavelength so that it's impedance is near 50 ohms. If it's a monopole cut the dipole length in half. Just remember, as I've already stated, that to get gain in signal strength in a particular direction gain will be removed somewhere else. Looking at the 3D gain distribution of a 1/4 monopole vertical antenna it resembles a doughnut laying flat. If you increase the length of the antenna to 3/4, 5,4,.. of a wavelength the gain distribution will look like a flattened doughnut. The gain will increase perpendicular to the antenna, but less above and below. This can be a problem with FM radio stations. High gain antennas increase the far away distance, at the expense of close in listeners. Since the antenna is hundreds of feet in the air the disk like high gain radiation pattern shoots right over the head off nearby receivers. If your goal is omnidirectional gain you are on the right track. I see, thanks for the clear answer. Yes, my goal is to increase gain horizontally, so it appears to be the right approach. Naturally, if the radiated energy is the same, the spatial distribuition would need to be arranged differently. And now that I think about it, there are various high-gain wifi antennae on the market advertising a gain well above 10 dB, which are all reported to increase reception quality perpendicular to the whip. PS1: If I wanted to learn a bit about antenna theory, what literature would you recommend for a beginner? This subject seems interesting. Thought it might be interesting for some. This doesn't relate directly to Moteino but I'll share this anyway... I use Hope RF modules (RFM22/23/69) for my own designs and have made a couple of boards with 'ready-made' antennas. I've used two different Linx antennas for 868MHz ISM-band and those are "ANT-868-USP" and "ANT-868-SP". Smaller (uSP) model is for remote controller based on Serpac CA-4 case and larger (SP) is for server/base station based on Hammond Manufacturing 1591XXSSBK case. Didn't use any simulations before PCB orders but simulated matching cirtuicts before applying those (easy/accurate to simulate for low RF frequencies) and final performance was measured with network analyzer. PCB's were ordered from IteadStudio (actually quite high quality for DIY projects). First layout for remote was my fist PCB ever and it had few optimization points which I corrected to second layout version. Antenna related observations were that PCB should have as solid ground as possible from antenna ground pads to core ground. I made some changes and used layer 2/2 only if absolutely needed ( + prefered vertical traces instead of horizontal) and added three component matching circuit between RFM and antenna. 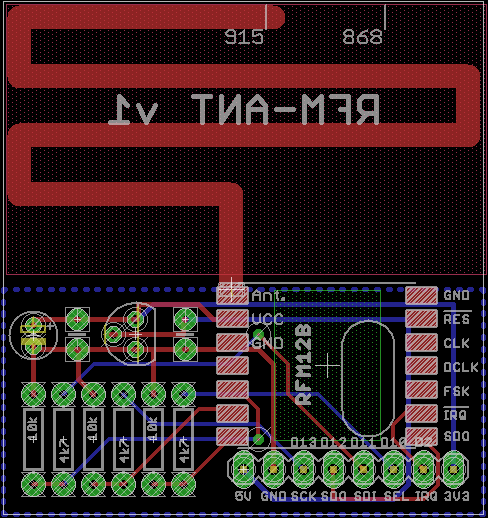 Also added more GND vias between layers to reduce parasitic inductance. I didn't have to use any matching (excluding 68pF series component which doesn't have impact on the impedance at that frequency) for the second layout and the performance difference between two layout versions were quite high. See attached figure. For server board I used much larger PCB and different antenna. Learned from remote desing that should prefer solid ground, vertical traces and a lot of GND vias. Added also three matching component to make sure that I can tune the antenna if it's needed without new PCB order. It wasn't so bad than I thought it would be (not so solid ground after all). Still decided to tune the impedance with 18nH shunt coil (between RFM and series cap). Tuning improved performance a little but it would be better with smaller coil (didn't have time/interest to fine tune). Now the performance for both should be quite ok, but of course near field effects (hand etc.) will cause some performance degradation. Don't have any range measurements yet but definetly will make some after I get software somehow functional. Attached also the board layouts if someone is interested in PCB size [mm] (doesn't include first layer which is quite full in both boards). Thanks for posting Nuudeli. What kind of distance are you reliably able to get from these? What power level are you using? My tuned dipole is trimmed to 5.8 inches for use at 915 MHz. The antenna is fed at the center, it is cut into two with one side connected to ground and the other to the radio’s ant pin. Does that mean that he has 5.8 inches of wire soldered on the ANT pin and another 5.8 inches of wire soldered on the GND pin? Or is it a total of 5.8 inches with one end of the wire soldered onto the ANT pin and the other end soldered onto the GND pin? Or is it something completely different? A picture would help immensely. What would the length be if it was monopole? A lot of this antenna theory is a bit over my head so I apologize in advance. If you search google for dipole antenna you will find lots of images that explain the principle. Hmm...I've looked at a bunch of sites on Google but none of them seem to mention how GND is figured in. Do I simply ignore GND, bend the wire in half, and attach to ANT? If so, why did John mention GND? Sorry, if it's obvious to everyone else.